Long may we contemplate the age-old questions of cushioning versus ground feel, weight versus durability, fire-engine red versus dull gray. Well, maybe not that last one. I’m as guilty as most in seeing if I can push the least amount of shoe to ultramarathon distances simply because they are fun shoes to run in. Climbing feels somewhat easier and even slow paces feel more effortless when I’m wearing a trail shoe in the sub-nine-ounce range. But it all comes down to how long my feet can take it, and over the last few years we’ve seen trail shoes trend toward the bulky and heavily lugged. I haven’t found a lightweight trail model in the last few years that I felt could handle ultras, so I defaulted to my standby 11 ouncers. The New Balance Summit Unknown ($110) may be the first trail all arounder in awhile that can do just that. The New Balance Summit Unknown has its heritage in the now-long-defunct MT101, but on paper this year’s model is a bit of a throwback. 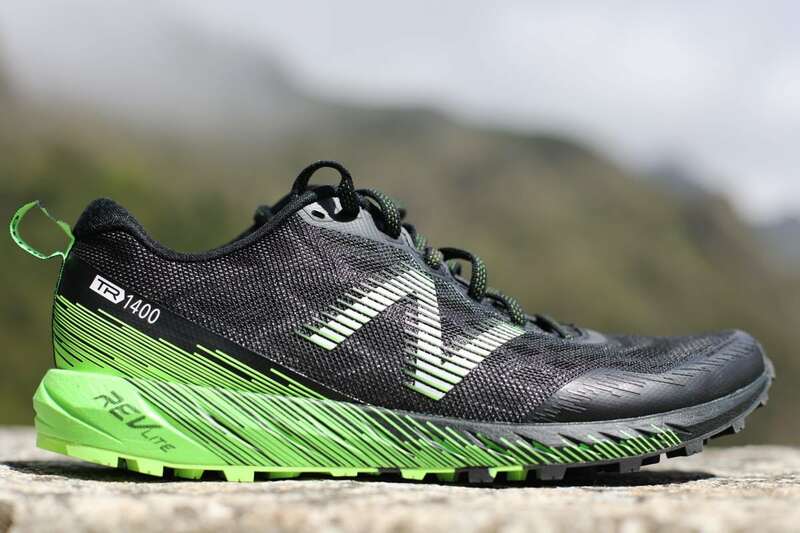 The Summit Unknown returns this line of lightweight trail shoes from New Balance to a 10mm heel drop and racing last based on the NB 1400 road flat. In short, the NB-J last on the Summit Unknown is narrow in the heel and midfoot with a moderately wide forefoot. This is similar to the last on the coveted MT110 ‘Air Anton,’ which had the wonderful NL-1 last now only used in the barefoot-specific shoe from New Balance, the MT10. Am I geeking hard enough for you yet? 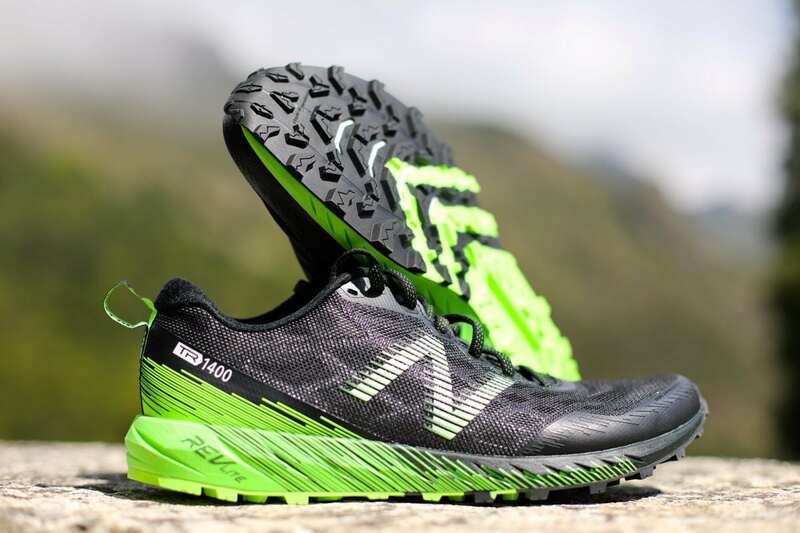 Borrowing heavily from the open-mesh upper design of the NB 1400 road flat, the Summit Unknown has the same light and airy mesh upper with a number of additions for durability. A welded-on rubberized toecap gives some protection up front, while the same protection is used around the heel cup for additional support and durability. The mesh is dual density with a durable webbing placed between the layers throughout the mid- and forefoot for a locked-down feel. The lacing situation is wide, flat, and stretchy, which doesn’t place much pressure over the absolute nonsense of a tongue, which deserves its own paragraph of disdain. As best I can tell, New Balance has been trying to create their own version of Salomon’s Endofit since the original Vazee Summit. The first version felt too loose and soaked up too much moisture, and I didn’t try the Vazee Summit v2. With the Summit Unknown, the design team took this gusseted-tongue concept into utterly useless territory as it bunches up and puts pressure on top of the foot approximately one mile into a run. While I understand what New Balance was trying to accomplish with this design, beta testing surely yielded poor results. The problem is that shoes are often on the factory-production schedule during testing, so I’m sure that they received negative feedback on the tongue but couldn’t do anything about it prior to production. In coming to understand shoe design versus production schedules, I’ve developed more empathy for the designers, but in this case, this was a major faux pas. So, what is the remedy to this glaring blemish on an almost-perfect upper? I cut the gusseted tongue on both sides. I don’t notice it now, but this soft and flexible material continues to slide down underneath the laces. This was an easy work around, but it is annoying given the locked-down fit throughout the rest of the upper. Again, the Summit Unknown has a narrower heel and midfoot and then opens up in the forefoot a bit. The insole on the Summit Unknown is flimsy, and I have read that wearers complain of the insole bunching up in the shoe when wet. I did not experience this after taking the Summit Unknown through creek crossings, and this shoe drains very well. Also, the Summit Unknown comes in both standard and wide (2E) widths. The New Balance Summit Unknown lateral upper. 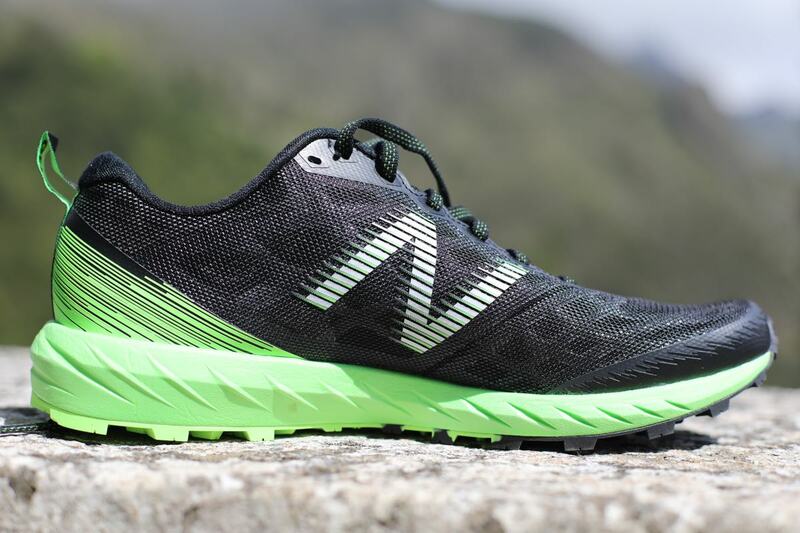 I have long been a fan of REVlite, New Balance’s premier go-fast EVA foam, which functions great as a semi-firm and protective trail cushioning system. If you haven’t run in REVlite in the past, I would place it somewhere between a Nike Kiger/Wildhorse and a Salomon Sense cushioning on the firmness scale. It is a foam that seems to take a long time to feel dead, and after a short break-in period my feet really like it. The total stack height on the Summit Unknown is 27mm to 17mm, including the 4mm lug height. The REVlite is aided by a forefoot Rock Stop plate, which provides just enough protection on the trail over sharp rocks. I like the rock plate because its enough protection for most trails, and it does seem to provide a little bit of forefoot rigidity for forward propulsion and to delay fatigue in my feet. The New Balance Summit Unknown medial upper. Full disclosure, I did not test this shoe on the flanks of Mordor during an apocalyptic event. Unfortunately, I didn’t test it on a whole lot of mud or clay due to the alarmingly dry spring and summer we’ve had in Colorado. I mostly tested this outsole on decomposed dry granite, which is sometimes loose and annoying, and wet rocks of the same nature. What I can tell you is that the HydroHesion outsole and its 4mm lugs do not wear down quickly. It grips wet rock well, but it’s not a state-of-the art outsole with the level of grippiness of Salomon on wet surfaces. 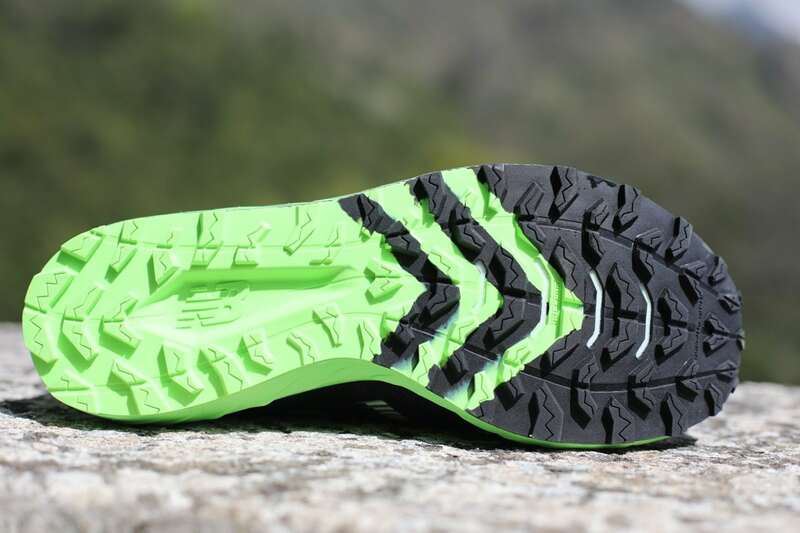 This outsole is a good all arounder, and what is nice is that it works well for road-to-trail and non-technical trails for faster running. Bottom line, the New Balance Summit Unknown is a great shoe. In my opinion, this is the only sub-nine-ounce trail shoe (8.7 ounces/men’s size 9) with enough protection for ultramarathons unless you’re under 30 years old and your feet can handle less protection. While the Summit Unknown feels a bit stiff and overly responsive at first, it seems to get a bit softer after a short break-in period. The outsole grips well and the airy mesh both drains water well and breathes well in the heat. Overall, the Summit Unknown is the obvious simple successor for shoes like the MT110 that you can lace up and forget about, and with a price of $110, why not have a pair in your trail quiver? Have you run in the New Balance Summit Unknown? If so, what do you think about the shoe’s various features? Are you a longtime New Balance wearer? Given your understanding of New Balance’s shoe history, what do you think of the Summit Unknown’s place in the lineage? Did you have the same problems with the tongue as our tester did? What features of the shoe did you think are its best? I have put some good miles on these, and love them. The tongue slipping is the only downfall. I have to believe as you stated that this came out during testing. It’s not like it takes very long for the tongue to slide down (less than a mile). However, with all my complaining, I do really like these shoes. They fit great and drain extremely well in creek/river crossings. Plus they don’t feel like your running in concrete. I’ve heard that these shoes were supposed to be the successor to the Leadvilles that were discontinued. I absolutely love (am still wearing a pair I sourced from Asia) the Leadville as I wear a 2E and it’s the only trail shoe I found that fits me well and can take a beating. Would you consider these similar to the Leadville? It seems like the last might be different and the 2E may not fit. To my knowledge, the Summit Uknown is the successor to the Vazee Summit, which is the successor of the MT101. Basically, the Summit Unknown is a RC1400 racing flat with lugs and a more robust upper. A better successor to the Leadville, in my opinion, is the MT910v4. 10.5 ounces, 8mm drop. The Leadvilles were great, and I’m not sure why they dropped that shoe? But, the MT910 has a similar feel with a semi firm but well cushioned feel and a really good rockplate. Awesome, thanks Tom. I’ll check those out. I really like this shoe albeit I feel like the fit is a bit tight in the toe box v. comparable size in Salomon. This could be remedied by going 1/2 size up (I believe) and/or thinnish socks. I wore these in SJS 50 where there were several water crossings and they seemed to drain fine to me with no sloshing. I’ve been running in the summit v2s, and my biggest complaint is the upper design draining poorly and retaining too much heat. This upper looks a lot better, though I won’t be rotating in a pair until September/October racing, where the heat isn’t going to be as much of an issue in summer training. Didn’t really find the tongue much of an issue, but I have them cinched down pretty hard when I’m racing. I think the Summit K.O.M. is the direct successor to the Leadville (vibram, revlite, 8mm drop), and I think the name shift reflects that La Sportiva stepped up to being the title sponsor for the Leadville 100? That and tying the shoe to a core line rather than having something that doesn’t fit their nomenclature for shoes. This is what I am really waiting for. It is starting to hit European online shops but mainly the GTX version. Waiting patiently to buy the non GTX version of NB K.O.M. Apart from the tongue slipping issue, there isn’t a bad thing about these shoes. Good price, grip and enough padding for longer races but light enough for fast running too. Recently won a 75 mile race wearing them with no issues so happy I bought them. Love the 1400v5 road shoe too as that’s my go to for tarmac. Do you find the grip of these road shoes adequate on the Hardrock course Bryon? As an outsider it seems like NB practically made the Summit Unknowns for you, so I’m surprised you’re not wearing them. What differences would you make to the Summit Unknown to get you to choose them over the regular 1400’s? Don’t get me wrong. The Summit Unknown’s a solid trail shoe. I’d say one of the best out there. Personally, I just find some advantages in the road 1400. They’ve worked just fine for two Hardrocks! 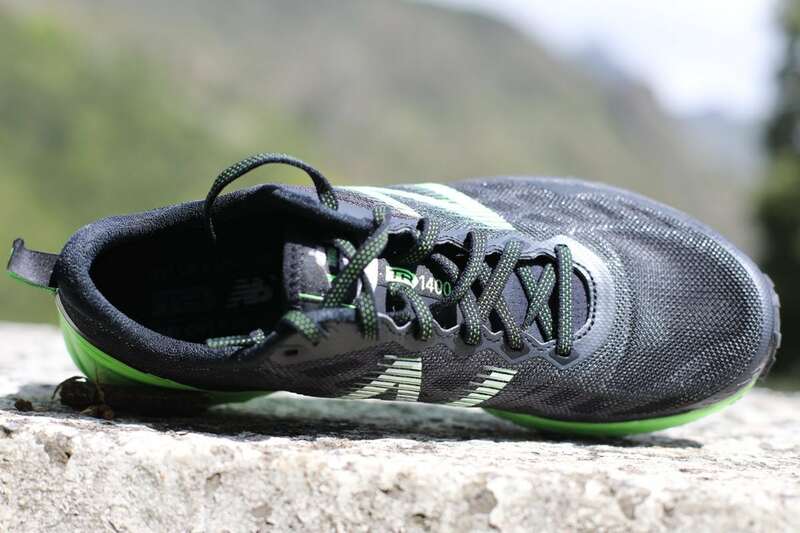 Great shoe – especially for up tempo miles and crushing climbs. Probably the fastest trail shoe on the market, but the tongue flaw you identified is really disappointing. For a multi-million dollar company with plenty of resources, you would think they would catch this type of glaring flaw as a part of their testing process. You shouldn’t have to cut holes in a $110 shoe just to get it to function properly out of the box. Overall, I give it an 8/10. I wish they would resurrect the 110D. Any news? Questions for those who have tried these shoes or any of the 1400s. Is that relatively massive 10mm drop something that one can adjust to easily? How nimble does it feel on technical terrain vs say a Kiger 4? I’ve been running in nimble 0-4mm drop trail and road shoes for the last two years and the 1400v6 I tried on last week felt super weird and uncomfortable due to the extra drop. Very curious about these but woah! Brady- I haven’t tried these, but I’ll comment on the Vazee summit 2, which I have, since I also sometimes run in 1400v3s, Terra Kigers, and the Salomon Sense Pro. I think the Vazee summit is nimble and light, but the taller and fairly narrow heel makes it less stable than the other shoes, and so I usually prefer other shoes for technical terrain. I like the 1400 a lot for faster road/smooth trails/occasionally rough trails. But I feel like in other shoes I land on my midfoot, and in 1400s I scuff my heels on the way down. In these shoes, 10mm drop feels like much less, perhaps half as much. Not like a road shoe with 10mm drop. I have enjoyed these shoes thus far — light, nimble with good cushion and protection. I find the drop can aggravate my Achilles a bit and the tongue as mentioned is a bit of a head scratcher, but overall a great effort from NB. For longer runs, the only relatively lightweight (sub 10 oz) options for me now are this and the Hoka Torrent. Bring back the MT110 (with a more durable upper)! Tom C, are there any modern shoes that you would say are close to the MT110 in terms of fit/feel/specifications? I’d give these shoes a 7 out of 10. Though I was skeptical about trying a shoe with a 10mm drop, I found that I didn’t have to work as hard climbing steep terrain here in the mountains of northern New Mexico. In fact my uphill climbs improved considerably with very little effort. I was not expecting this. But there is also a downside to this. When I switch to other shoes with a 4mm drop or less, the amount of quad work required on similar runs feels much harder and I struggle to regain the muscle balance I’ve built over time with hard work. For this reason, this is a shoe I use once in a while when I need an easier workout on tough climbs. I wish New Balance would tweak this shoe in the future and lower the drop to 8mm perhaps. You’d still get the gain it offers but not lose the muscle you’ve built running in other tail shoes. Last couple of thoughts – it’s nice to see this level of protection in such a lightweight shoe. I wish other manufacturers would offer more options for experienced mountain trail runners. The tanks that are out there are not worth my time. I also had trouble with the tongue slipping on this shoe. So, a few adjustments on the next version just might result in the perfect mountain trail shoe for me. The plastic upper is uncomfortable. I had to cut it with a knife to make it work for me. The tongue cuts off circulation in the foot when running uphill for an extended period. As noted, insole is flimsy. Okay for up to 10K. Beyond that, I’d suggest something else. I must say that I enjoy that the shoes don’t get soggy from sweat or creek crossings. Also, really like the light weight. Traction from sole is pretty good. I also had and loved the MT101. Am trying the Unknowns now and having the same tongue problems. If it’s not sliding down, it’s too sharp and cutting into my ankle. On other New Balance shoes, like my Zante v3, the sock-liner integrated tongue is attached to the heel liner which I imagine keeps it from pushing forward. Odd that the Unknown tongue is not like this as you can see clear opportunity for it. Might be an interesting modification if you know how to sew. Do that and soften the tongue edge to not be sharp and downward and this shoe is perfect! I plan to use it for SwimRun next year. I bought a pair of Summit Unknowns after running in the 1400 V5’s and loving them. Prior to this I hadn’t owned any NB’s for over 10 years. I’ve been a club runner for about 40 years, and do between 60-80k most weeks on a mixture of road and trail. There is also a lot to love about the summit unknown, but the tongue is a problem and should be replaced by the one in the racing flats which is great. As noted by a number of people the tongue slips down, I’ve cut a couple of slots and fed the laces through to stop this. The other problem is that the piping around the top edge of the tongue is too hard and tight, the consistent pressure and rubbing has caused inflamation of the tendons in the front of the foot! This is a first for me with any shoe I’ve ever owned. I have trimmed the piping off, reducing the tongue length by about 7mm and hope this will solve the problem. I should add that I’ve run about 250km in the shoes so far, with most runs being between from 20km – 40km long. I also experienced the tounge slipping: went to my local shoemaker who sewed a small loop of webbing to it, to lace through, like most running shoes has . Took no time, cost €10, now it works perfectly. Love the shoe. I replaced my Leadville with the Summit Unknown’s and then the Summit kom’s. After experiencing the tongue issue and taking the advise of this column I sewed a loop on to the tongue…slippage problem resolved. Unfortunately, the Unknown’s toe box is not as (high) roomy as the Leadville (which were the perfect shoe). 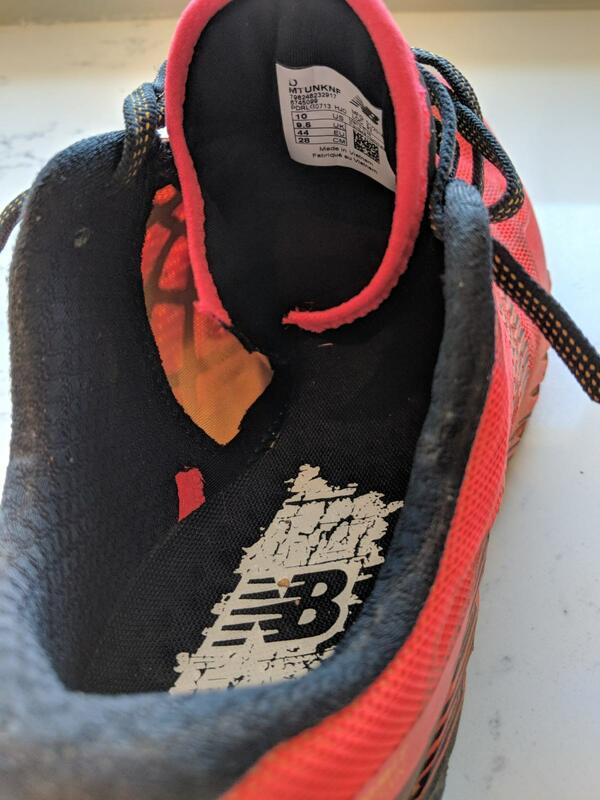 For shorter training runs, 10-15 miles they were fine but once the miles added up (my feet swelled) and the lack of a high toe box pressed on a nerve on the top of my big toe, causing significant nerve pain. Upon review it seems that this is not unique. Any suggestions on what shoe has a higher toe box? I use the Summit Unknown since last summer. I love them : extremely stable, fast, light and excellent grip. The revlite cushionning is great. For the tongue sliding issue, instead of cutting it, I pull it up and fold it down over the top of the lacing. Hopefully this issue has been adressed and the problem will be solved for the next edition of this shoe. In response to Julien’s comment to fold the tongue. I tried this before I cut it and it didn’t work. It helped the slippage problem a bit but did not relieve pressure on the tendons. As mentioned in my earlier comment, as annoying as the slippage is, the bigger problem on long runs is the pressure on tendons caused by the hard piping on the edge of the tongue. I can report that since my last post (when I had just cut the piping off) I’ve run many more kms in the shoe without tendon problems. If you don’t cut this off it is like running with the laces too tight – ok for shorter runs but more problematic with longer runs or use on successive days. If NB fix this tongue issue this shoe will be a cracker.